Mallet toe is a common deformity affecting a single or multiple lesser digits. It involves flexion deformity of the distal interphalangeal joint of the toe. Mallet toe deformity presents more frequently in females and commonly affects the longest lesser digit. Increased weight-bearing pressure at the apex of a mallet toe is associated with pain, hyperkeratosis with extravasation, nail deformity and ulceration. Conservative management consists of footwear changes to reduce crowding of the digits, toe props or wedges, cushioned toe sleeves and palliative reduction of hyperkeratotic lesions. 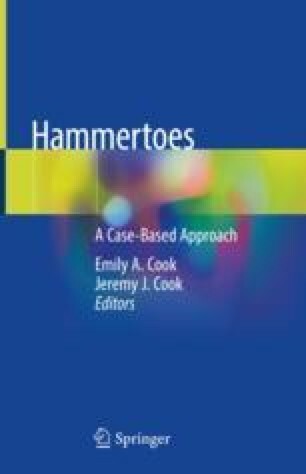 Several different surgical techniques are described for the management of mallet toe deformity, including percutaneous flexor digitorum longus tenotomy, arthrodesis and arthroplasty of the distal interphalangeal joint and distal phalangectomy.